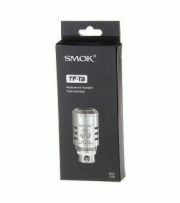 The SMOK TF-T3 0.2ohm Triple Replacement Coils (5 Pack) is a pack of five TF-T3 triple coil heads for the SMOK TVF4. Each coil in this 5-pack is made up of three vertical coil heads with own tubes which ensures an outstanding heat distribution and improves the airflow. Each coil also features organic cotton for premium wicking and one-of-a-king vaping experience. Available in resistance of 0.2 ohm, the TF-T3 triple coil heads operate at 40W and 130W.